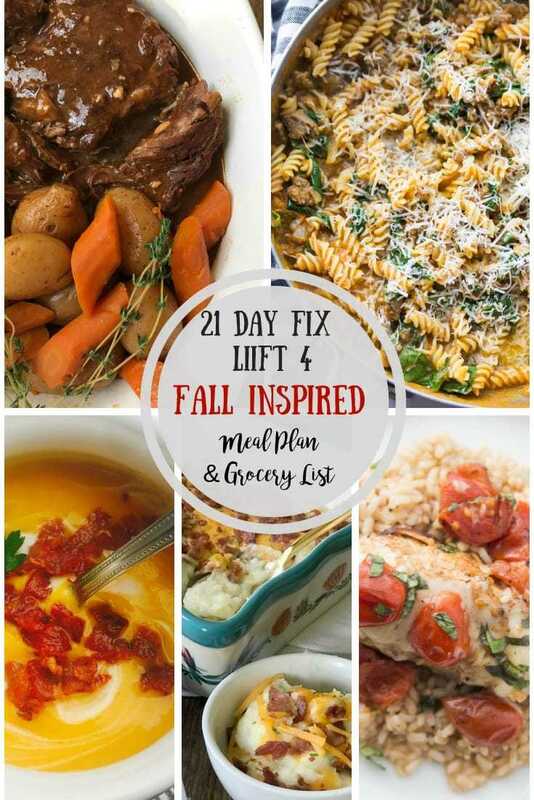 Looking for a Fall Inspired 21 Day Fix Meal Plan & Grocery List? 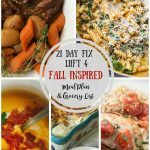 Want a yummy Meal Plan for Liift 4? Look no further! While it may not exactly have felt like fall here in Pennsylvania this past week, the calendar says it’s time…and the air actually felt a little cooler today. Until this week I was conflicted; I love summer and I have a tough time transitioning to picking pumpkins when it’s hazy hot and humid outside…but now I am officially ready. It’s time! Bring on the boots, and sweaters, and super soft leggings. So, in honor of the first week of fall, I have gathered a few “almost fall” recipes to push us through to cooler temps and lower humidity. Welcome, FALL! In our CSA we have had tons of spaghetti squash over the last couple weeks and I’ve seen butternut squashes return to the produce aisle. Caprese needs one more time in the spotlight before the summer is over with all of these tomatoes from my garden. And of course, what would a fall meal plan be without a pumpkin recipe?! 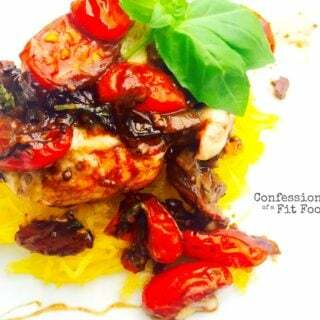 Check out – How to Prep Spaghetti Squash Four Ways! Monday: Beef Pot Roast (Instant Pot or Crock Pot) If you are a pot roast purist- make the recipe as is- with the potatoes and carrots. If you want a little something different, try it with the decadent Instant Pot Loaded Cauliflower Mash instead. Tip: Follow the cauliflower recipe first, then when you put the cauliflower into your food processor, begin following the pot roast directions, omitting the potatoes and carrots. Otherwise, keep everything the same. Finish up your mash while the pot roast cooks! Tip #1: If your coconut milk comes in a can, it is most likely separated. First, save the clear liquid for your (affiliate link) Shakeology– it whips up nice and thick! Second, after you make the pasta, save the rest of the white solid for Friday’s soup. Tip #2: The rest of your pumpkin puree can also be divided and used in your Shakeology (mixed with Cafe Latte you can make your own Pumpkin Spice Latte if you didn’t score some of the limited edition Pumpkin Spice flavor) or in one of these sweet n’ savory pumpkin recipes! 1/4 teaspoon of dried oregano **plus any fresh herbs you might have. 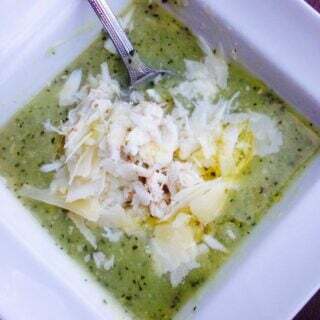 I used a teaspoon of chopped fresh parsley and basil from the garden. No fresh herbs? Oregano alone is just fine! Tip: Not grilling weather? We made these pork chops in the oven last time because we ran out of propane as we heated up the grill for dinner. We just poured the marinade over them in a glass pan and baked at 350 for 30 minutes. They were so juicy! Tip: Ingredients listed are for 1 personal pizza, adjust accordingly for how many you will make. For example: 4 pizzas? 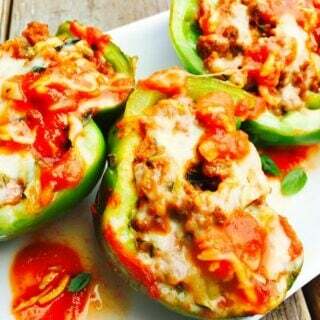 You will need 1 ⅓ c of ground beef, 1 c diced mushrooms, etc. 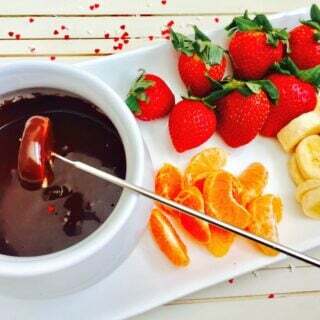 I love these recipes and am super excited I found you. These fall dinner recipes are wonderful. I just make the pumpkin pasta for dinner tonight. What does your typical meal plan look like for the day? I am just curious how you fit in breakfast, lunch and snacks too. Thanks for any advice!